I hired this movie once, and when I got past the band aid on one of the privates in this V.D. clinic, not the cleanest of it's type, I turned off. A couple of years later, I watched it again, and found this quite a funny pic, funnier than I thought it'd be in fact. 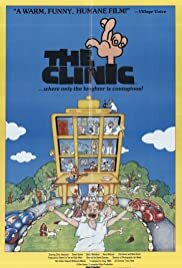 The film in set in the life and day of a Sydney V.D clinic, where people coming in complaining of syphillus and gonorrhea runs high. We have a young disgruntled employee telling his case to the matron, losing his job, over a disreputable illness, where later on that day, something not so funny happens. Haywood of course is excellent as a gay and laid back doc, areal likable sort, plus we have a long list of stars, many who've disappeared off our screen, decades ago now. Simon Burke as a nervous student inturn on experience was indeed fun to watch, picking a not so good day, to observe, one homosexual patients, eyeing him. Burke too has problems of his own, one sexual, that's causing him concern. We have an obscene phone caller calling Evison, hinting sexual suggestions where she dishes it back, plus one nutty patient, if you can call him that, a bomb hoax, plus a stoned nurse, plonked down in Haywood's office, knitting, watching men drop their drawers. We also have one patient with crabs, who easily accepts an offer to be used as a photographic example, where he goes into a he man pose. There are laughs aplenty in this movie, which at times works well as a drama too. We have the ins and outs of some patients you won't forget, in a movie you have to see, to realize just how funny it really is.